The best college writers succeed because they practice writing, reading, thinking, and researching on a regular basis. The Bedford Handbook, Tenth Edition, fosters a culture of practice with how-to instruction for college writing tasks, with advice that allows students to pivot among disciplines, and with more print and digital activities than any other college writing resource. The tenth edition is our most practical ever. And because you have a wider range of college writers than ever before, the handbook offers more opportunities to personalize instruction and content. Adaptive quizzing, rhetorical grammar content, and a variety of flexible custom options make it easy to tailor the book to your students’ needs and your program’s needs in a way that no free Web content can. The Bedford Handbook can be packaged at a significant discount with one of two innovative digital products. Writer’s Help 2.0, Hacker Version is a complete online resource powered by smart search, which means students get the writing help they need even when they aren’t familiar with composition terms. It includes full searchable Hacker content, diagnostic tests, assigning and tracking tools, more than 300 exercises, and LearningCurve adaptive quizzing. LaunchPad Solo for Hacker Handbooks is a robust practice platform with nearly 400 exercises, activities, and LearningCurve quizzes. 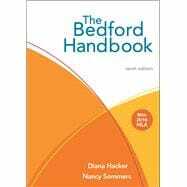 No matter how you choose to use The Bedford Handbook, you can depend on publisher support for training, workshops, and the personal service you’ve come to expect from Bedford/St. Martin’s. Diana Hacker personally class-tested her handbooks with nearly four thousand students over thirty-five years at Prince George’s Community College in Maryland, where she was a member of the English faculty. Hacker handbooks, built on innovation and on a keen understanding of the challenges facing student writers, are the most widely adopted in America. Hacker handbooks, all published by Bedford/St. Martin’s, include The Bedford Handbook, Tenth Edition (2017); A Writer’s Reference, Eighth Edition (2015); Rules for Writers, Eighth Edition (2016); A Pocket Style Manual, Seventh Edition (2015); and Writer’s Help 2.0, Hacker Version.